The Catalan Sheepdog or Perro de Pastor Catalan as they are also called, are lovely, spirited and friendly dogs, they are also very intelligent and extremely agile which means they make great agility dogs. The breed was chosen to be the mascot at the 1992 Olympic Games which is not surprising because not only are they gorgeous looking but very sporty too. They were originally bred for herding which they do very well, having a natural instinct to protect things. Because they are so smart, they will obey their shepherd but are also very capable of working on their own, herding and protecting their flocks. They are a very popular choice for a family pet because they adore children and get on with other animals whilst at the same time boast being brilliant guard dogs. Catalan Sheepdogs are well proportioned with smart rectangular bodies. They are medium sized with strong well-proportioned heads in keeping with the rest of their bodies. They boast straight muzzles with black noses and dark amber colored wide-set eyes, displaying an alert and intelligent expression. Their ears are triangular with cute tips, and they’re set quite high so they hang close the dog’s head and covered in long hairs that form a type of appealing fringe. Catalan Sheepdogs weigh between 35 and 40 pounds and stand from 17 to 19 inches high at the withers. Catalan Sheepdogs have well-muscled bodies, proof of their agility and strength. They have short, very well muscled necks and a smart straight top line and a well-developed chest. Their tails are set low and long, forming a hook when they are relaxed but raised when moving, although their tails don’t bend over their backs. The Catalan Sheepdog breed is an active, hard-working dog that loves to be doing things and kept busy. They have a strong instinct to herd, protect and guard. They are also very brave dogs but with this said, they are very charming characters. Catalan Sheepdogs are renowned for their loyalty and devotion to the people they love and who take care of them. They are a great choice for a family due to their kind natures, they get on well with other animals and they adore children. They are highly adaptable dogs but need to know who is the boss. They are calm by nature but they do need lots of exercises and as such don’t make very good “apartment dogs“. They are much more suited to living where there is a nice big garden because they need lots of regular and energetic exercise to stay happy and healthy. Because they are so intelligent, Catalan Sheepdogs need to be well socialized and trained from an early age and they do well if they get a certain amount of training throughout their lives. This is because they need to know who is the boss but because they are so clever, training them is really easy. They are also brilliant guard dogs, having a strong natural instinct to guard and protect. Catalan Sheepdogs are an ancient breed that dates back to Roman times. It was the Romans who brought the breed with them to the Iberian Peninsula in around 200 to 100 BC when they invaded these lands. In fact, the Romans bought two kinds of dogs with them, the first was to defend/protect and tend flocks of sheep and to prevent enemies from attacking them. However, the second dog they brought with them herded cattle and are thought to be the ancestors of Italian Bergamascos. These dogs were subsequently put to dogs that were native to Catalan and so the Catalan Sheepdog was born. It’s presumed their offspring are the foundation of many breeds seen in various parts of Europe today. This includes the Catalan Sheepdog as well as the Ca de Serra d’Aires which is native to Portugal, the Briard which is native to France as well as some others including Britain’s Bearded Collie and the Old English Sheepdog. They gained popularity in Spain because of their courage and lovely natures, they were used as messengers and sentries during the Spanish Civil War and earned themselves a reputation of being brilliant guard dogs. However, the breed dropped in numbers after the Second World War and it was not until the seventies that a group of people got together to rescue the Catalan Sheepdog from vanishing off the face of the earth forever. Catalan Sheepdogs are still considered as “rare” dogs although thanks to the dedication of many breeders, their numbers are growing and many are still used as herding dogs. 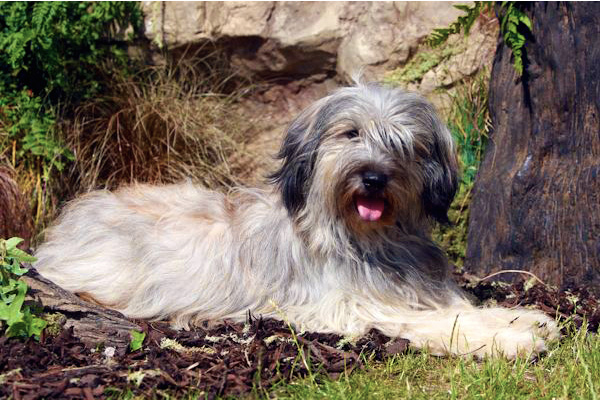 The Catalan Sheepdog boasts a long coat whether wavy or straight and this means regular grooming is a must to prevent it from becoming tangled and matted. Brushing them at least three to four times a week gets rid of dead and loose fur which helps keep it off the furniture and carpets. Because they are very active dogs, Catalan Sheepdogs must be a fed good quality food and a well balanced nutritious diet. Just like any other breed, regular check-ups at the vets are a must as they get older, and so they are kept up to date with all their vaccinations. The vet will also be able to keep an eye on their teeth, to make sure they are not suffering from a dental problem which is often a condition they are prone to suffer from. Their coats are quite rough with a thick undercoat, and they shed in two stages, starting with their fronts and then their back halves, so at one point they boast two completely different coats at both ends of their bodies. Their coats are a mixture of several colors with shades of gray, sable and fawn. The Catalan Sheepdog is generally healthy dog, but like all breeds, they’re prone to hip dysplasia. You may be aware that some breeds of dog and their crosses can be susceptible to inherited disease. Of course, you want to be sure that the dog you choose is as healthy as possible, and you would like to know that it has not inherited any undesirable disease-causing genes from its parents. There is some help in that DNA tests for diseases in purebred dogs are available for some conditions in some breeds, but there are not very many such tests just yet! There are also, however, a number of clinical veterinary screening schemes that dog breeders can use to increase the probability of producing healthy puppies. The Catalan Sheepdogs lives to be somewhere between 12 and 14 years old. Potential dog owners should be aware that, at present, the application of various health screening results to breeding programs is not always straightforward, and breeders may make choices for various reasons. A responsible breeder though will always be willing to discuss relevant health issues with you. Breed clubs are often useful sources of breed-specific information. Obedience training is helpful, but you may need special training to redirect its herding drive. Another trait seen sometimes is nervousness or extreme shyness. The Catalan Sheepdog puppies need to be started at puppy obedience classes as soon as they are vaccinated. This will help him learn basic commands and sets the owner up to be the person who is in charge of the household. Socialization is essential to avoid shyness and aggressiveness with strange people and pets.